As part of the Consideration of Constitutional Issues, which was agreed to in the 2008 Relationship Accord and Confidence and Supply Agreement between the National and Maori parties, a Constitutional Advisory Panel was appointed in August 2011. This panel was to ‘continue the conversation’ about how to govern the people, land and resources of New Zealand. Whilst this panel had other items to discuss, such as the length of our parliamentary terms and the number of MPs in Government, it soon became clear that their main area of focus was to encourage and establish interest in entrenching the Treaty of Waitangi into a written constitution for New Zealand. Had they succeeded in convincing enough people in New Zealand that this was best for New Zealand and the people who live here, it would have been the ultimate victory in a long and carefully strategized war against New Zealand’s democracy. A war which has been waged for the past 40 years by part-Maori activists and their Treatyist allies. 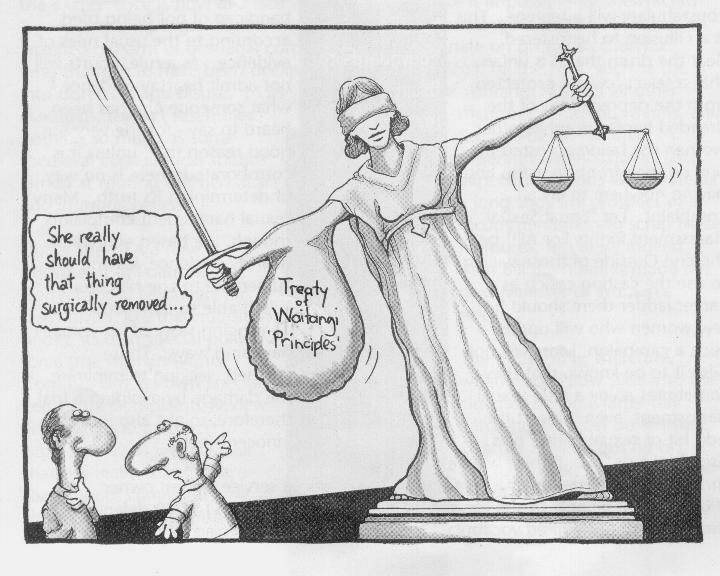 Despite an overwhelming lack of support for a ToW entrenched constitution, which should have given a very clear message to the panel members putsching that agenda on just how New Zealanders felt about race based laws and power, the CAP’s report, presented in November 2013, made numerous recommendations to the Government which were designed to advance and enhance part-Maori power in both local and central Government. Whilst the recommendations are numerous, the ones relevant to the point of this tale revolve around part-Maori representation in local Government. (See report link below) It seems that no matter how often the people of New Zealand exercise their democratic rights and vote against having unelected, unaccountable, race-based seats in local Government, activists pushing this agenda refuse to get the message. There seems to be no lengths to which they will not go in order to force their agenda upon the population at large. We’ve seen the Auckland Super City amalgamation and the Statutory Maori Board forced onto Auckland by the Government and the absolute disaster that has become. Northland, Hawke’s Bay, Tauranga and Wellington are all considering amalgamation plans put to them by the Local Government Commission. In every case, part of the amalgamation plan is the establishment of an unelected and unaccountable-to-ratepayers part-Maori Board. Basil Morrison seems to be the public face of the force driving many of the strategies to enforce these race-based agendas. Mr Morrison is currently Chair of the Local Government Commission, Chair of the Local Government New Zealand Superannuation Board of Trustees, a director of Landcorp Farming Ltd and Civic Assurance, and a member of the Waitangi Tribunal. In the past, he has been Chairman of the Ohinemuri County Council, Mayor of Hauraki District Council, a member of the Waikato Regional Council, President of Local Government New Zealand and Chair and Vice Chair of the Commonwealth Local Government Forum from 2005 to 2009. Basil Morrison therefore has considerable knowledge of local government matters at a local, national and international level. Mr Morrison was also on the New Zealand Geographic Board from July 2010 until July 2013. It was under his watch that the ‘h’ was forced into Wanganui, in spite of the fact that 80% of people polled on the issue did not want it, and the North Island and South Island were given Maori names even though 81% said ‘No’ to that. Now, in his role as Chairman of the Local Government Commission, which he holds at the same time as being a Waitangi Tribunal member, he is actively pushing the amalgamation of councils agenda, everywhere he can. And, in every case, the amalgamation proposal includes an unelected and unaccountable-to-ratepayers part-Maori Board. Giving more and more power to only one part of any society, separated from the rest by either race, religion or culture, can only be a recipe for disaster. It is undemocratic and unconstitutional. It impinges on the human and democratic rights of every other person. Having been denied public support for a Treaty of Waitangi based Constitution, this pressure to accept unelected and unaccountable-to-ratepayers part-Maori representation in local Government has all the appearance of a rear guard attack. As the situation is Auckland has shown, once part-Maori Boards are established, huge amounts of money are demanded from the general rate take, for part-Maori aspirational projects which have little or no benefit to the rate payers in general. The aims being part-Maori focused, and not community focused. Naturally they will protest that the community in general will benefit, but such Board s and Councillors have not shown exactly how that will happen. And since these representatives are appointed, not voted for by the rate payers, they are not answerable to rate payers on any decisions they make or what they spend money on. Yet, having votes on Council decisions, they can have a huge influence on the lives of all rate payers. The full report by the Constitutional Advisory Panel can be viewed here, with the recommendations to Government starting on Page 16. Not only are these special ‘Maori’ boards, wards or whatever totally undemocratic, they cost a huge amount of ratepayers money. And for what? What do they actually achieve apart from some invented approval and then expecting to be paid. It seems ‘they’ have to vet everything, and be paid for this, and what I would like to know is how are ‘they’ any different from the rest of us? They all of mixed race these days and I can’t for the life of me work out what they can actually bring to these appointments. 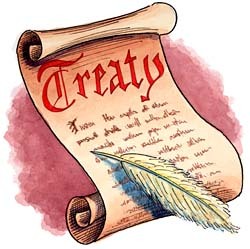 Prior to the Treaty many tribes were marauding up and down the country killing, eating people and taking slaves. They didn’t care one iota for the environment or anything apart from conquering weaker tribes and taking what they had. It’s all a massive con and must be stopped in its tracks. If only we had a strong Leader who would lead us to ending all of this racist nonsense which is costing billions that could be put to much better use for everyone. We can certainly do that Bill, if you are sure. But the reason it is so hard to make any headway with this issue is because too few people are prepared to stick with it. Too few are willing to actually do anything about it beyond reading or talking about it. There are those of us that do what we can, which is to try and inform the public and to fight where we can, and there are others who sit back and want others to do all the work and fight the good fight for them. Which one are you Bill? Helen, you are right, it sure is a massive con job. And that racist traitor-to-NZ Key is making it all worse almost every day. 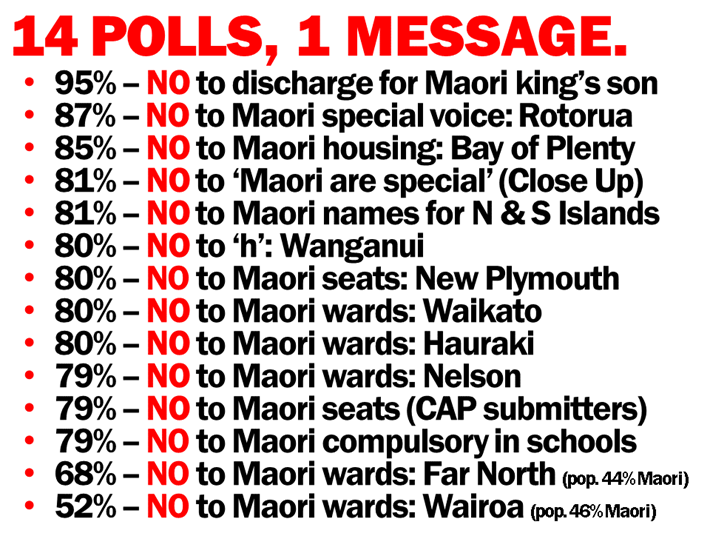 Another reason for lack of traction is the attitude of the Fourth Estate to the broader issue of the definition Maori and whether or not the part Maori that constitute the vast majority of New Zealanders and who consider themselves Maori should be allowed on the Maori electoral roll or receive state funded benefits that accrue to Maori. This question is never raised or discussed in any public forum that I’m aware of and yet so many taxpayer funded grants, scholarships and other forms of “assistance” are based on the premise that the applicants are members of a separate race to the rest of New Zealanders. The definition of who is a Maori is very different in this country than the definition of who is an Aboriginal in Australia for example. Of course all the other issues raised in this forum are scarcely ever discussed in the media either. The question of how the media has been captured and effectively muzzled needs to be understood before an effective “remedy” can be administered.